What’s the best approach shoe for a multi-pitch loving climber? Here’s my experience. Around 2008 after a shoulder injury started limiting how hard I could climb, I started transitioning to multi-pitch gear climbing. Lots of engagement but without needing lots of shoulder stability or strength. This required a revamp of my footwear. Idyllic strolls up flat easy canyons were replaced by steep slogs up hard trails – no more sandals! My beloved Zamberlan boots were fine for routes with rap off descents but they were too large and heavy for over the top and walk off descents that were becoming common on my weekends. This led to my quest for the perfect approach shoe. Several friends swore by the 5.10 Tennie Approach shoe but I found them to be too floppy and they provided insufficient support for heavy loads in harder terrain. I tried several other shoes from suppliers such as Patagonia, Merrel and others but at that time all they had to offer were primarily slightly rugged running shoes in “mountain” colours. There is a saying I have to remind myself of once in awhile. 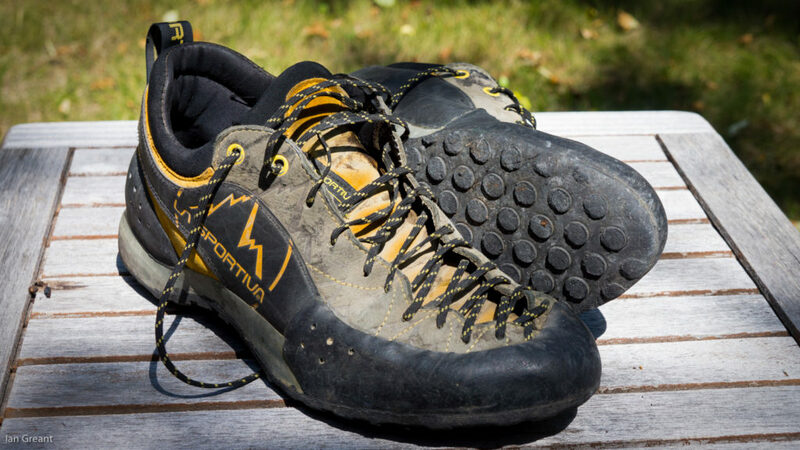 “Buy right or buy twice” I’d been eyeing the La Sportiva Ganda approach shoes but at over double what other approach shoes cost I found it hard to justify the price… and each time I’d try a new pair of approach shoes I’d consider them but again rule them out on price. Why spend almost boot money on an approach shoe? Especially if you only get a year out of them. After killing yet another pair of shoes that weren’t designed to meet my requirements, I was wandering through a local store (the now defunct and much missed “Wicked Gravity”) and discovered they had a pair in my size and on a substantial sale. Needless to say, I bought them and have never regretted it. Purchased in 2010 and now in 2015 after climbing hundreds of pitches in them I have the following to report. They are awesome. If your climbing takes you through technical terrain that you don’t want to lug a pair of boots around for, then buy a pair of Gandas. The slip lasted front gives near climbing-shoe performance. I frequently climb up to 5.7 in them and have climbed harder grades. It’s great to wear a single shoe for an entire day out. The board lasted rear gives near boot-like performance in terms of support stability. The heels are strong enough that punching down scree slopes is easy. The moulded insole is very supportive. I wear insoles in all my other shoes but find these are supportive enough without that I can carry a pack, have a decently long day and not totally destroy my feet. Durability is fantastic. They are resolable and I’ve been through one set of soles already. My preferred boot-fitter wasn’t able to get the Sportiva resole kit for me quickly so we went with the 5.10 rubber and I have zero complaints. There was some stitching on the side that blew out but my local cobbler fixed it up for me for just a few dollars. Where have I climbed in them? What sort of routes have they proven themselves on? I’ve used them on a variety of rock ranging from Limestone, Quartzite, Granite, Gneiss and Sandstone. My first big trip in them was Red Rocks and found them to be excellent for the scrambly descents. Local for me is the Bow Valley in Alberta, Canada. They have been amazing for routes like Eisenhower Tower – 5.5, Ha Ling – NE Face – 5.6, Easy Street – Mt Yamnuska – 5.6, Mother’s Day Buttress – Cascade Mountain – 5.7, etc. All routes that aren’t that technically hard and have over the top and down descents. I tend to use the crap out of my gear, at least the gear I love. If it works for me then it’s going to get used a LOT and it’s often only once something has been repaired or patched several times will I finally give up on it. At the rate these shoes are wearing I’im forecasting probably another two resoles before the rest of the shoe is past the point of no return. At my current rate of climbing that’s likely to be another 3-4 years of use. Maybe more. Even if I had paid full price I’d still consider them a good investment. Not many valid ones. I sized them fairly tight and wear very thin socks. As a result on long hot days I sometimes blister the crap out of my feet. In early May of this year I did Mt Lorette in them. We made the bad choice to cross the river immediately across from the climb in the morning and didn’t anticipate how much the river would rise in the late afternoon. As we couldn’t cross the river back to the car we had to walk back to the next bridge – 6K up the trail and then 6K back along the highway to the car. My partner was a hurting unit so on reaching the bridge I left my pack with him and jogged most of the way back to the car before I got picked up. So.. I logged 20+ kilometers with 5 of them on hard pavement. My feet definiitely hurt after that but I can’t fault them for it. Bring an extra pair of socks for big days. I find swapping out socks before my descent makes the descent a lot more comfortable. Maybe not required for you but my feet sweat and sweaty socks make for blistered feet. Laces. They come with a great set of laces. It’s worth investing some time into adjusting the fit with some lacing tricks.